Steven (Chicagoland, United States) on 31 May 2010 in Architecture and Portfolio. Thomas Jefferson looks out over the plaza and seawall that lines his memorial, keeping an eye out on the contractors' completing the project. 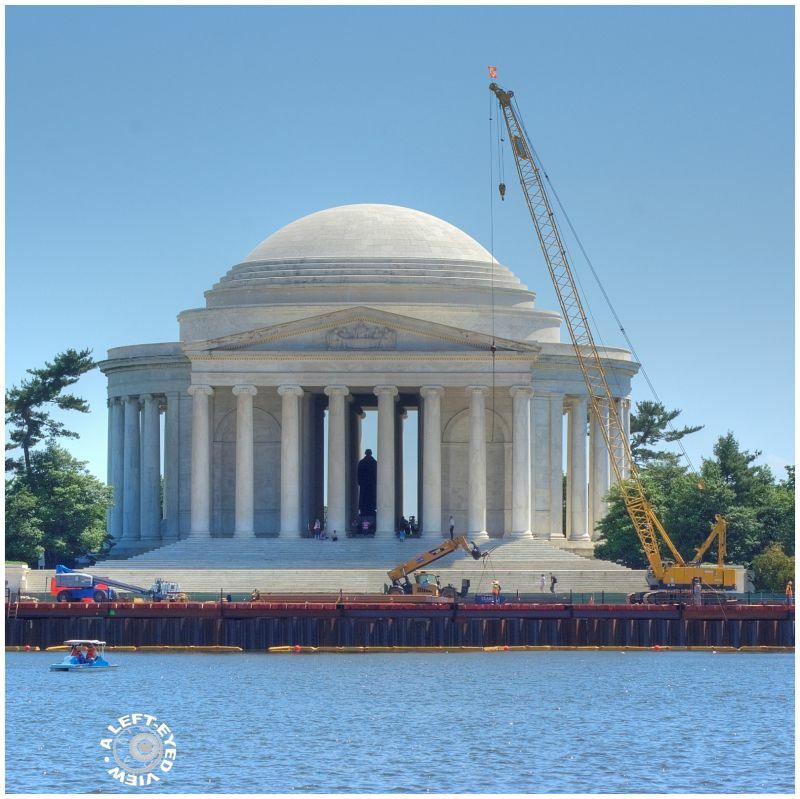 Begun in November of 2009, National Mall and Memorial Parks is repairing the plaza and seawall, which consists of forty-one (41) four-foot (4'-0") diameter drilled shafts and fifty-three (53) eighteen inch (18") battered piles to support a new seawall and the existing north plaza. The historic seawall stone cladding will be restored and reinstalled. Luckily my walk around the tidal basin revealed better shots of the Jefferson memorial unobstructed by the cranes, which will be shared with you. Photo taken in Washington, DC on May 5, 2010. There is something magnetic and fascinating in watching "big boys toys" at work Steven. They always transport me back to my childhood. Beautiful capture. Thanks for the explanation also Steven, I really appreciate it :) Gives me the feeling of visiting myself. Have a nice day. That is one very impressive memorial . .
Looks like constructions are everywhere. Cool capture ! Great shot and it looks and sounds like it will be great when completed! Great capture and your framing is excellent. Have a good afternoon Steven. A lovely shot of the memorial and construction work.